Have you been searching “puppy stores near me” online and come across our page? We hope so because we’ve got some information to share with you! Continue reading to learn more about what you’ll get when you come into Furry Babies to purchase our adorable and charming little puppies. What kind of puppies can you expect? 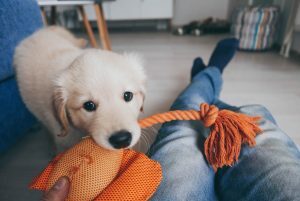 When looking for “puppy stores near me” you should know that at Furry Babies we will always have a purebred pup who will put a smile on your face. We take the utmost care of our puppies, from the moment they come to us, until the very day they go home with you. While we pride ourselves on having a large selection of puppies, we also pride ourselves on ensuring each animal gets the best care. Before coming to our store, each furry friend receives a health check twice to make sure they are feeling their best. We offer a superb puppy package! All puppies receive all first-year routine puppy vaccinations. We also have an excellent puppy warranty. Your puppy comes with a one year warranty against hereditary or congenital disease. We also provide you with a behavior and nutrition plan — just like bringing a baby home from the hospital! Ask yourself, “are the other puppy stores near me anything like Furry Babies?” We can answer that – nope! We offer financing options for your puppy! We know that getting a puppy may not be in your immediate budget which is why we offer financing options so that you don’t go home empty-handed!. Our process is extremely simple and quick. The financing forms take soft looks on your credit. We want you to know that we will never pressure you into using financing or pet loans, but use it as an opportunity for those who need it. Now that you’re armed with more information about us and you no longer need to search online for “puppy stores near me,” come into our store today!